Recently some hot new rods have come out in the fly fishing market, and after several years of providing the industry standard with the Helios; Orvis has come out with another masterpiece of a fly rod. The HELIOS2 is the answer to the newest, latest, and greatest in the fly fishing industry, and it is something everyone needs to cast to feel how ridiculously awesome it is. This review is going to go over the 9' 8wt Tip Flex 4pc, and I am going to go over the review with the rod being cast with the Orvis Hydros All Rounder Saltwater Fly Line; so other lines can obviously influence the action of the rod making it load less aggressively or more aggressively. When casting rods, I like to start out ultra short, and then work out intervals of fly line; so you can test out the action at different lengths. Many people often blast out as much line as they can, but in real life fishing situations with an 8wt; you are often fishing from 15' to around 70'. When starting out short the rod loads wonderfully with a foot or two of line out and just a tapered leader. It is about as accurate as an 8wt could be when loading a couple feet of fly line, and it worked well into the wind and with the wind at my back. A few more strips of line, and I was casting again with complete accuracy both into the wind and with the wind at many different angles. Real life saltwater fishing, and open water casting involves wind, and often it is blowing. I was picking targets and landing right on the money each time more or less, and the rods was throwing with straight line precision accuracy. I was only under 40 feet, and the rod felt like a super accurate trout rod chucking dry flies. I was ready to feel how much line this beauty could throw when applying some force to it. I stripped off line so my cast was getting to be in the over 50' mark, and the first forward stroke came by my head with lightning speed, and as the loop completed in front of me the line yerked out of the reel with the drag making a purr, and the reel revolved practically a full rotation. I thought, "WOW.....some serious power on this rod.....!" I pulled off more line, and noticed the rod can easily pick up the whole fly line belly with ease and some running line as well. One back haul, and one front stroke and the line laser beamed out again! This H2 is a beast! It can throw line like you can't imagine!! I then kept on pulling line out to do the macho bomb make yourself feel good stroke, and the rod pushed out line like nobody's business. 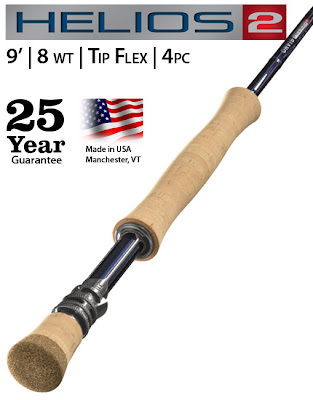 This rod works from super short to super long, and it feel like a charm in and out of the wind. The rod also held its accuracy with distance involved, and it also did not buckle when you tried too hard to punch the cast. The rod really works well with anglers of all casting types too. I have noticed that novices along with experienced casters seem to really groove with the action of this fly rod. I have seen people who claim to be less experienced casters have really nice casts shoot through the guides of this wonderfully powerful fly rod. I have also seen some mind bending casts zing through the guides with some "heavy hitter" casters; so whatever your ability is, this rod will work for your casting stroke. My favorite is how you can strip back to the running line/rear taper portion of the fly line with this rod, and you can back cast shooting line out hard, and then haul it into the forward stroke and the line shoots like a cannon causing the reel to spin into an outward rotation. You know the rod is loading hard when that happens! You can swing by one of your local Orvis shops to try one of these fine fly rods out. This 9' 8wt fly rod is the most enjoyable single handed 9' 8wt fly rod I have ever tried out so far! If you are in Portland Oregon, stop by the Portland Orvis to get yourself outfitted with one of these amazing H2 fly rods!